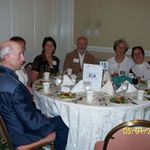 The Philadelphia Chapter of the Pennsylvania Equine Council meets at Cathedral Village, 600 East Cathedral Rd, Philadelphia PA. in Classroom 2 of the MAIN HALL. Our list of meeting dates for 2016, always on a Monday; 8/8 (CR1), 9/19, 10/31, 12/12 (CR1), at 7:00PM. Email the Philly Chapter County Director at phillypec@gmail.com for directions or information. 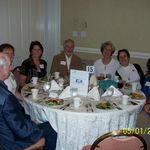 The April 4, 2016 Philly Chapter Meeting guest speaker will be John Gross. John's talk will be about trailer safety. John has been with Springfield PD (Montco) for 39 yrs in uniform and has been assigned as the Traffic Safety Division Supervisor since 1999. Prior to police work, I was a PA inspection mechanic and still do almost all my own repairs and maintenance on all my vehicles. I grew up in a camping family and we trailered all over the US and Diana & I continue to trailer around with our 32 travel trailer for a few weeks each year. I also have been trailering horses for approx the past 32 years and got started in that past time with an old used Hartman trailer from Phila PD that I rebuilt. 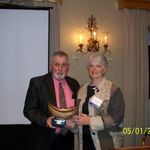 On May 1, 2012, the Pennsylvania Parks & Forest Foundation honored Pennsylvania Equine Council members Bud & Gwen Wills as recipients of the 2012 Education Award. 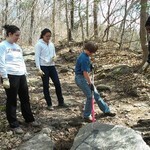 June 6, 2010, West Mount Airy, Philadelphia- An industrious group of volunteers met to improve wildlife habitat and protect native plant species. The work area was on the Orange Trail between Kitchen's Lane Bridge and Mt. Airy Avenue. This is a beautiful section of woodsy trail, which is a hike only trail, with many tall shady trees, a view of the Creek, and always a cool breeze. Native species are diverse, mature and regenerating. Hickory, green ash, white, red and scarlet oak, black walnut, tulip poplar, white pine, hemlock, Mountain Laurel, ferns, euonymus, verbena and others. Wildlife is plentiful with foxes, turtles (now laying their eggs), frogs, toads, screech owls, wood ducks, songbirds, hawks, deer, kestrels and butterflies. 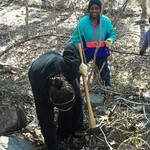 The invasive species removal included devil's walking stick, wild roses and burning bushes. Stephen Jones, WRV, was the technical advisor on how to prioritize the removal and how to dispose and disperse the plant material. The Pennsylvania Equine Council serves Pennsylvania's equine population through education, stewardship and programs that promote safety. Our goal is to ensure that horses in Pennsylvania will always have access to safe trails, will be safe in their barns and on the road and will always have access to the kind of care that enhances the quality of their lives. The Pennsylvania Equine Council volunteers included riders from 3 barns; Monastery Stable, Courtesy Stable, Northwestern Stable. 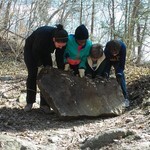 The Wissahickon Restoration Volunteers (WRV) is dedicated to the restoration of the natural areas of the Wissahickon Valley in Philadelphia's Fairmount Park. 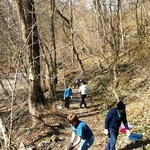 WRV organizes volunteers to remove invasive plants, establish native vegetation, improve trails and pick up trash. Cynthia Turecki, Assistant Barn Manager at Courtesy Stables, said; "As park users & inhabitants of the Wissahickon Valley, we have a responsibility to our horses & our trails. To maintain both, with a happy, healthy balance is our goal. To protect & support the environment is equally as important as is our responsibility to our equine partners." Diane Garvey- "We are fortunate to be able to ride horses in this beautiful park. 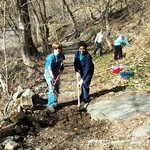 WRV dedicates a lot of volunteer labor improving the value of the woods and we wanted to show our support. Besides, we all had fun interacting with people from the other barns and the WRV guys were knowledgeable and upbeat." Diane Schrader says about the event; "I showed up because I care about the park and its future. I also came because I want to support the horses and equestrians who use the park in any way I can. I learned about what types of plants and trees are invasive and why it's important that they are removed. They take up precious real estate that is needed for the native plants and trees which provide food and shelter for wildlife. It was enjoyable being part of a team and working together to improve the condition of the park." 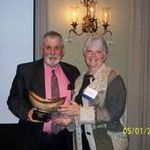 Steve Jones- "I have been looking forward to doing restoration work led by equestrians in the Wissahickon for a long time. It's really exciting to me to get a chance to work with horse riders, who are always such interesting people and have such a great take on the park and what it provides. The equestrians brought a terrific spirit of stewardship to the work they did. We worked for hours on a trail that is not even used by equestrians; the people from PEC clearly "got" the fact that protecting the ecology of the park benefits everyone who uses it." A few of the invasive plant removal volunteers included (left to right) Joe, Sanna Randall, Steve, Cynthia, Diane G., and Carmella. Coolers with cold drinks, snacks, loppers, saws, shovels, insect repellant, sunscreen and work gloves were weapons used in the War on Weeds. Bud removing Devil's Walking Stick. Sue and husband, Paul cutting down & cutting up burning bush branches. In the rear, Steve Jones, WRV Steering Committee, is crewchief. Marti, an equestrian from Monastery Stables, searching for invasive wild rose bushes to dig up and remove. Hay Marti, have you found it yet? 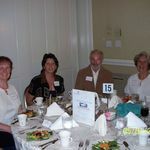 Check out our photos from the day by clicking here. 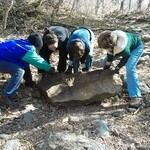 On Sunday, April 18th, Pennsylvania Equine Council Trail Stewards Diane Garvey from Monastery Stable & Cynthia Turecki from Courtesy Stable led a group of equestrians on a mission to correct a nearby bridge foundation from being lost. PEC believes that "less is better" when interfering with nature. So, the idea would be to interfere a little now, or interfere a lot, later. As this is our first, we hope of many projects, we'd like to first thank our volunteers who came to help. Our crew was so ambitious we finished the work in less than half the time expected. From Monastery Stable; Jan, Marti & her husband Paul, Liz, & Carmella. From Courtesy Stable; Walt, Diane & Erin. From Northwestern Stable; Sue & her husband Tom & daughter Ali. 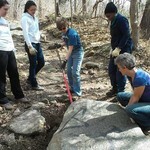 We'd also like to thank David Bower from Fairmount Park & Kevin Groves from Friends of the Wissahickon for supporting our efforts & providing the tools to get the job done. We'd also like to thank the Pennsylvania Equine Council for providing us the training & the support we needed to get the job done!